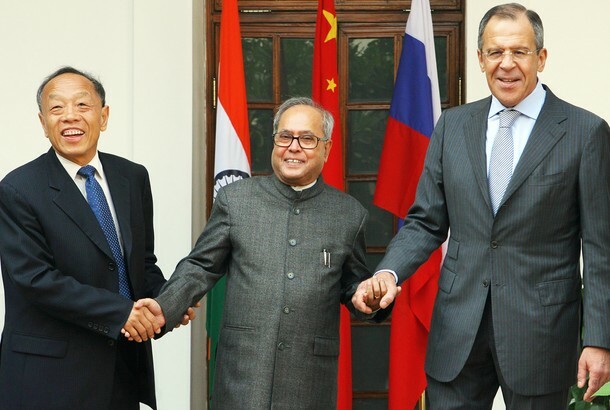 Russia, China and India together with Iran and their allies want world peace and international harmony. Ain't that a relief? Russian, Chinese and Indian foreign ministers on Wednesday stressed their countries' commitment to multilateral diplomacy, support for dialogue among civilizations and religions, and condemnation on terrorism. In a joint communique issued at the end of their trilateral meeting here, Chinese Foreign Minister Li Zhaoxing and his Indian and Russian counterparts Pranab Mukherjee and Sergei Lavrov reaffirmed that "trilateral cooperation is not directed against the interests of any other country," but "to promote international harmony and understanding and find common ground amid divergent interests." The Communist Party of India (Marxist) Polit Bureau on Saturday welcomed the government initiatives on the External Affairs Minister Pranab Mukherjee's visit to Iran and talks on the Iran-India gas pipeline among others. Among the initiatives welcomed by the Polit Bureau on the foreign policy front also includes the recent meeting of the foreign ministers of India, China and Russia in the capital. Why dont you write about hooliganism of big countries? Say sort of imperial attitude!